Soon many people may be wondering why they are seeing links with http://g.co/ in them are and whether they should be trusted. The short answer is that they are auto-generated by Google for URL shortening purposes, similar to how Twitter started using t.co. If you’ve been following the domain world this past year, you may recognize the .co TLD which actually stands for the country of Columbia, but has been marketed as a .com competitor. A few companies have paid big money to get their hands on very short .co URLs. In particular, Overstock bought o.co for $350k. Twitter bought t.co and Amazon bought a.co, z.co, and k.co. The .co authorities mentioned that one-letter .co domains are worth about $1.5 million now. Hard to say what Google paid for it, but I imagine it was in the $100k range due to the actual registration date (see below). Though the news of g.co just hit the web, Google actually registered the domain back on April 26th, 2010 according to whois domain records. Strangely, Google only registered it for 2-years… it is set to expire on April 25th, 2012. I’m actually a little surprised Google doesn’t usually register its domain names for longer periods of time: Google.com is set to expire on September 13th – imagine picking up that domain on a domain drop! No one really knows how Google will use g.co at this point but Google has stated that it will be used just for Google websites, so anyone clicking on them can trust that they will be going to a Google website. I suspect Google might use it to send people to Google-plus and/or Google docs. Google assures us we will find out soon. 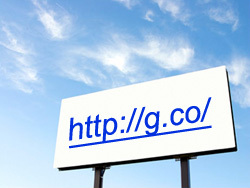 goo.gl is Google’s public URL shortening service, similar to bit.ly and t.co. All three services intend to offer some level of protection against malware & affiliate scams, provide proper 301 redirects for SEO, and offer some level of reporting. However, g.co intends to be Google-only links, so all reporting will probably be just for Google’s eyes & I’d expect they will handle the redirects properly. Considering Google intends them to be links to only Google properties, they should be very safe. However, if Google does end up using the links for Google+ or service where users are allowed to create their own content, then the link may not be completely safe (though I expect as with t.co and goo.gl links, Google will be monitoring them for abuse). I’ll update this post as more information becomes available.